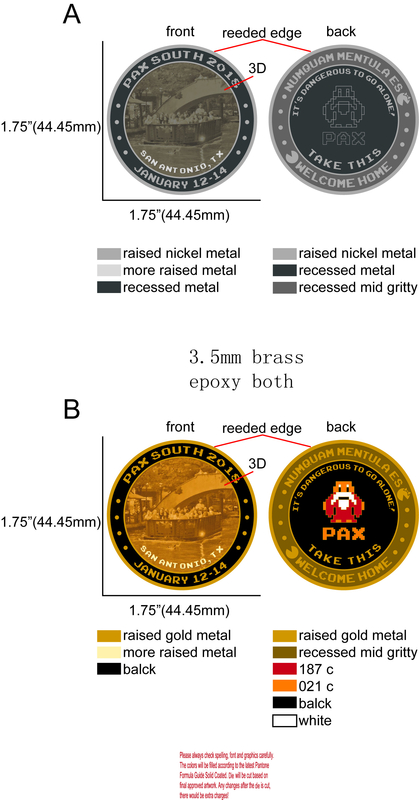 PAX South 2018 Challenge Coin - Contact Kiddercorp for coins! The pin looks good so far! OMG! my bad...had a convo about pins at the same time as typing the message, chatting with friends. The COIN looks good so far! When do the orders have to be in so that the coins arrive before PAX? 37 days and counting! I e-mailed them on Friday to get them to take the 2018 out from the bottom of the coin, but they haven't e-mailed me back...I sent another one yesterday. I approve of all the changes! PAX SOUTH 2018 at the top; date without the year at the bottom. PAX word in orange in the middle of the game-side of the coin. I don't know how I feel about pixel font being used throughout ALL the coin.  Maybe just inside the game portion of the game-side (not along the edge)? ALSO, the last version does not have a space in "MENTULA ES"! Is this last version final. Where is the link/email to order? Since we are waiting on Kiddercorp to get back to us, we can start gauging interest. Fill out the form if you're interested in coins!! Did we get the space put in MENTULA ES? Were we able to get the font changed to only make the Zelda text the pixelated font? Also, did we change "PAX" to be orange? We have final proof? (Without the repeat "2018")? We were able to put the space in, but not change the font. Lol. I like how it says "Please always check spelling, font, and graphics carefully." Yeah. That's a good idea. Looks good. Can't wait to order a set! Please send your full payment to [email protected] via PayPal before filling out order form. Shipping costs are $3 USD for 1 to 3 coins, and $4 USD for 4 to 6 coins. Shipping for 7+ coins is $6 USD. Shipping costs are $15 USD for 1 to 6 coins. Shipping for 7+ coins is $31 USD. I woke up from a nap where I had a dream about handing out challenge coins last year. I dashed out of bed and hit the forums, hoping there would be challenge coins again for 2018. And lo, @RILMS is making my dreams come true, again! Thank you for supporting the community! Thanks! Just happy to be part of it. Thanks for everything you have done putting this all together. 35/100 Regular Coins and 63/100 Colour Coins have been sold! So far, 41 Regular and 68 Colour coins have been sold! So far, 47 Regular and 73 Colour coins have been sold! Finally got around to ordering mine. Completely slipped my mind for a bit. So far, 51/100 Regular and 77/100 Colour coins have been sold! I hear there is a giant pair of cowboy boots outside of the North Star Mall in San Antonio? So far, 54/100 Regular and 87/100 Colour coins have been sold! Only 2 weeks until PAX starts!! @RILMS when do you estimate the first batch will ship? Also, so far, 56/100 Regular and 96/100 Colour coins have been sold! First batch of colour coins are almost sold out, but there are still lots of regular coins! There is one colour coin left of the first batch! I sure do hope I get my coins before I leave for PAX South in a week! How are we notified when they ship? I received a confirmation email from PayPal that my payment was sent, but that was it. If I'm not going to receive my coins before I leave for PAX, I wonder if I can update my shipping address to have them shipped to where I'll be staying in San Antonio...? Is there any way I can confirm that they even have my order? "The coins are on the way to me from the factory now. I will probably be shipping them out to you guys on Friday (5th). They should arrive by Wednesday (10th)"